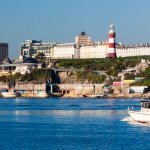 Plymouth Hoe | Blog | The Devon SEO Co.
Caressing the landmark limestone cliffs of the beautiful coastal city, Plymouth Hoe is a famous waterfront attraction. There are plenty of things to do for all the family, from simply relaxing and enjoying the views to exploring, eating and drinking. Boasting stunning views across Plymouth Sound and Drake’s Island, Plymouth Hoe is one of the best natural harbours in the world, with landmark features including the iconic lighthouse, Smeaton’s Tower. Closer to the shoreline, the Tinside Lido swimming pool (an art deco building dating from 1935) is open to the public during the summer months. It is consistently voted into the top 10 ranked outdoor pools in Europe, with a sun deck which is one of the best places in Plymouth to get a great tan. The Royal Citadel is an impressive 17th century fortress that stands at the eastern end of the Hoe. For many years, it was the most important defence in England from sea attack and it has been in constant military occupation since it was constructed. Today, it’s the base of the 29 Commando Royal Artillery. Plymouth Hoe’s name means “high ridge” and is believed to date from Anglo Saxon times. It is famous for its links with the renowned English sea captain, Sir Frances Drake. He was said to have played his famous game of bowls at the Hoe in 1588, before sailing out with the English naval fleet at high tide to battle with the Spanish Armada. This was how Drake’s Island got its name, as it was recorded as being called St Michael’s in 12th-century historic documents. However, it was renamed Drake’s Island from the late 16th century onwards. The Hoe has a long, broad promenade which doubles as a spectacular military parade ground. It is frequently used for displays by the Royal Marines, Royal Navy and the Army but it also welcomes travelling funfairs and hosts open-air concerts. The annual Plymouth Armed Forces Day will take place this year on 30th June. Parades, air displays and military demonstrations combine with competitions and fun activities to provide a day out for the whole family. This year’s event will be particularly special, as it will also be celebrating the centenary of the Royal Air Force. Another annual event, MTV Crashes Plymouth (alias Ocean City Sounds) is now in its fifth year. The live music extravaganza takes place at Plymouth Hoe on Saturday 15th July. This year’s event features Busted, Clean Bandit, Louisa Johnson, Martin Garrix and other top artists. The 2018 British Firework Championships are due to take place on 8th and 9th August. Top competitors from across the UK including Smart Pyrotechnics, Illusion Fireworks, Phoenix Fireworks and others will provide a spectacular display at this amazing family event. It has been held at the Hoe for 21 years and has been a huge success since it was first launched by trade body, the Event Services Association, in 1997. As well as playing host to a plethora of family events, Plymouth Hoe is also close to the city centre – the largest shopping centre in south-west England outside Bristol. The shops are a mixture of everything from exclusive boutiques to high street names and designer brands. In such an amazing part of the UK, it follows that you would expect to receive an equally excellent SEO service. The Devon SEO Co specialises in driving an increased amount of search engine traffic to our clients’ websites, creating a successful SEO strategy to boost your brand’s ultimate success. Contact us to find out how our professional services can help your business to succeed.